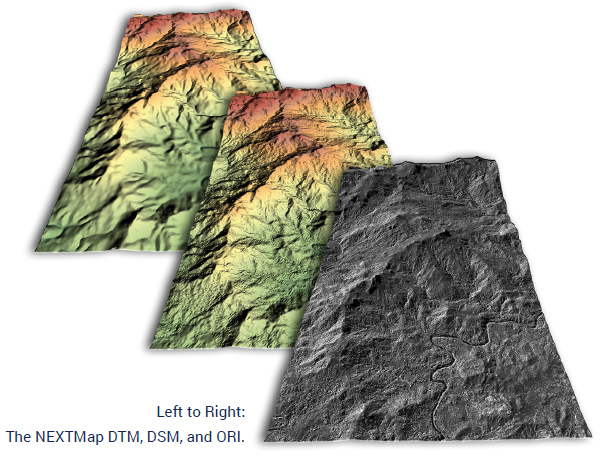 Intermap's DEM products are 3D raster datasets with elevations captured at 5-meter postings or every 5 meters. They are generated using Intermap's STAR technology (Interferometric Synthetic Aperture Radar), which is mounted to an aircraft. The high-resolution NEXTMap database from Intermap Technologies® provides seamless, wide-area digital elevation data and images, collected using advanced technologies, to enable accurate geospatial analyses across the globe. Consisting of a digital surface model (DSM), digital terrain model (DTM), and orthorectified imagery (ORI), NEXTMap is ideal for everything from engineering and infrastructure to regional and national mapping. 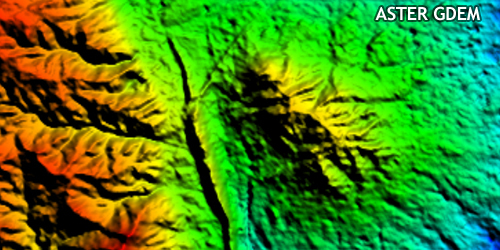 NEXTMap products consist of seamless, wide-area, and current terrain information that is available in hundreds of projections, datums, and file formats. A first-reflective-surface model that contains elevations of natural terrain features in addition to vegetation and cultural features such as buildings and roads. A bare-earth model that contains elevations of natural terrain features such as barren ridge tops and river valleys. 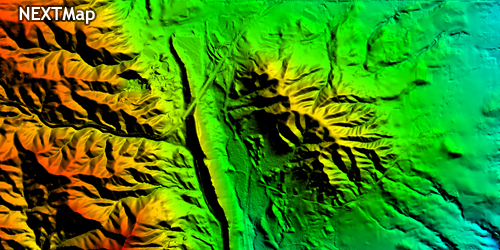 Elevations of vegetation and cultural features, such as buildings and roads, are digitally removed. A grayscale radar image of the earth’s surface that has been corrected to remove geometric distortions caused by the terrain.